On your walks, the main thing that separates your warm, soft Greyhound from the cold, hard steel of a Greyhound bus (among other vehicles) is a leash. Here are a few important things to consider about leashes. The longer the leash, the less control you have. Standard 5-6 foot leashes are fine for walking one dog in an area with little congestion, allowing the dog to explore the surroundings a little bit. Leash laws are common now and our state parks in Maine require leashes no more than 4 feet in length. A 3-foot traffic leash is preferable for a trip to the veterinarian or a pet supply store, when taking a walk by a busy street, or going to an adoption demo or crowded event. Your dog is close to you and is easier to control. The regulations of the therapy organization through which my Greyhound is certified require the use of a traffic leash on his therapy visits, but I prefer a 2-foot leash for this big boy. If you haven’t tried a short leash, do consider buying one or even making one. You’ll be pleasantly surprised at how easy it is to manage your dog. To make one, buy ¾-inch or 1-inch webbing at a sewing store and a clip from a hardware store. Sew a wrist loop at one end, the clip at the other, and at each end of the webbing, sew a box pattern with an X inside to make it secure. FlexiLeads are retractable leashes with large plastic handles. They can extend up to 26 feet, giving a dog a lot of freedom and can be locked at any length. FlexiLeads are not a good choice for a very energetic Greyhound, especially one with a high prey drive. Greyhounds excel at racing because they have the power to attain high speeds very quickly. 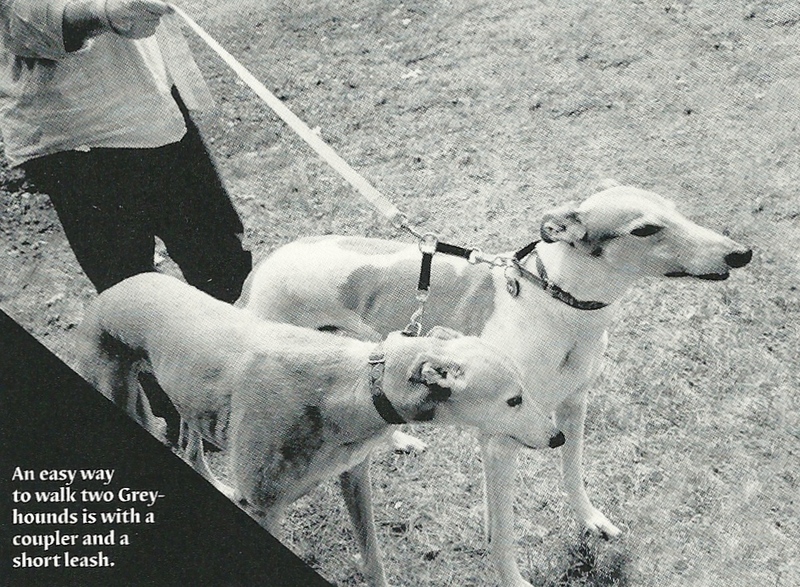 With this type of leash unlocked, a very active powerful Greyhound can take off and pull a person to the pavement. If the FlexiLead slips out of the hand, Greyhounds often become spooked by the handle clattering behind them on the ground and may run off in fright. Especially if the dog has never been on a FlexiLead, the sudden stop at the end of the leash after a quick acceleration can cause a dog to sustain a neck injury resulting in pain, weakness, or paralysis. Most dogs learn fairly quicklywhere the end of the lead is. Many of us have two (or more) Greyhounds and walking them on two 6-foot leashes is not twice as much fun when they go in opposite directions. Consider getting a coupler, available at many pet supply stores. It holds two dogs together so they can be put on one leash. There are two clips to connect to their collars, each with a short piece of webbing that attaches to an O-ring for the leash clip. This enforced doggie togetherness can make your walk more enjoyable and you are more in control. Many a Greyhound has pulled a leash out of a hand especially if the leash loop is held in the fingers. Your dog may be walking along perfectly at ease when something catches his eye or he may get spooked and then take off. It happened to my husband on Christmas Eve when our Greyhound caught sight of a running deer in the woods and instinct kicked in. Place the leash loop around your wrist and grasp the leash with your fingers for a more secure hold. Never loop a leash over your thumb or around one or two fingers, or you may end up with a dislocated or fractured digit. I’m not keen on children walking Greyhounds, as most don’t have the strength to control Greyhounds who will pull suddenly. You’re at an adoption demo, trying to show the public what great dogs Greyhounds are, and your dog starts barking, showing no sign of stopping. Modify his behavior by a quick snap of the leash so it pulls on the collar and gets the dog’s attention. Even worse — you notice your dog has started to pee in the store. A leash correction most likely will stop it mid-stream. Last but not Least: Use It! I’m sure every adoption group has gotten the call — a Greyhound has been hit and killed by a car. Given all we do to help these dogs get the retirement they deserve, it’s a tragedy to let them be endangered for lack of a leash or because the owner didn’t know how to properly use a leash.